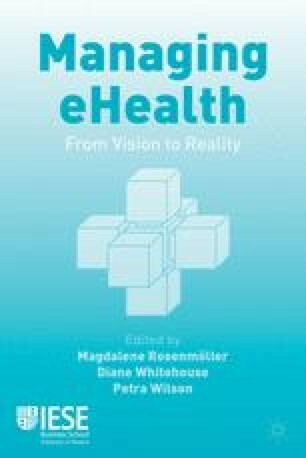 Information Technology (IT) is now so integral to healthcare delivery that it has been suggested that the “e” in eHealth is redundant and should be dropped (Ebels, 2012). In the healthcare sector, both patients and physicians are facing a rapidly changing and challenging environment, due to the increased use of eHealth tools. General practitioners were the first to embrace office-based computers around 40 years ago; at that time the development of eHealth in primary care was bogged down by several issues. They included cost, the variety of systems available and the difficulties in migrating from paper-based records with a familiar format to electronic ones with different structures. Some of these problems persist. However, a bigger challenge today is the integration of data generated in one component of healthcare delivery into the wider healthcare IT system, so that, in terms of providing good patient care, a more seamless record can be shared across all three fields of primary, secondary and social care. Ball, J., Borger J. and Greenwald, G. (2013, September 6), “Revealed: how US and UK spy agencies defeat internet privacy and security”, The Guardian. http://www.theguardian.com/world/2013/sep/05/nsa-gchq-encryption-co des-security. [Accessed 26 November 2013]. Chain of Trust (2013), Chain of Trust: Understanding Patients’ and Health Professionals’ Perspective on Telehealth and Building Confidence and Acceptance. Final project report. http://www.eu-patient.eu/Documents/Projects/ChainOf Trust/EPF-report-web.pdf. [Accessed 26 November 2013]. CPME (2008), E-Health — Consent and confidentiality. http://cpme.dyndns.org:591/ adopted/2008/CPME_AD_Brd_251008_181_EN.pdf. [Accessed 26 November 2013]. For more information, please see: http://www.cpme.eu/data-protection/. CPME (2013), CPME statement on “The eHealth Action Plan 2012–2020: innovative healthcare for the 21st century”, http://cpme.dyndns.org:591/Adopted/2013/CPME_ AD_Brd_27042013_017_Final_EN_eHealthActionPlan.pdf. [Accessed 26 November 2013]. Ebels, P. (2012, March 7), Putting the “e” in e-health. EUobserver. http://euobserver.com/e-health/115436. [Accessed 26 November 2013]. eHealth Governance Initiative (2012), Discussion paper on implications of the proposed general regulation on data protection for health and eHealth. http://www.ehgi.eu/Download/eHealth%20Network%20Paper%20-%20eHGI%20Discussion%20 Paper%20Data%20Protection%20Regulation_FINAL%20adapted.pdf. [Accessed 26 November 2013]. eHealth Network (2013), Guidelines on minimum/non-exhaustive patient summary dataset for electronic exchange in accordance with the cross-border directive 2011/24/ EU. http://ec.europa.eu/health/ehealth/docs /guidelines_patient_summary_en.pdf. [Accessed 26 November 2013]. European Commission (2008), Summary document on the European Commission initiative on telemedicine and innovative ICT tools for chronic disease management, 30 May 2008. http://ec.europa.eu/health/archive/ph_overview/health_forum/docs/ ev_20080530_rd04_en.pdf. [Accessed 26 November 2013]. European Commission (2010), The European eGovernment Action Plan 2011–2015: harnessing ICT to promote smart, sustainable & innovative government, COM (2010) 743 final, http://eur-lex.europa.eu/LexUriServ/LexUriServ.do?uri=COM:2010:0743:FI N:EN:PDF. [Accessed 26 November 2013]. European Commission (2012a), Discussion paper on semantic and technical interoperability, 22 October 2012. http://ec.europa.eu/health/ehealth/docs/ev_20121107_ wd02_en.pdf. [Accessed 26 November 2013]. European Commission (2012b), eHealth Action Plan 2012–2020 — Innovative healthcare for the 21st century. COM (2012)736 final, http://ec.europa.eu/digital-agenda/ en/news/ehealth-action-plan-2012–2020-innovative-he althcare-21st-century http://ec.europa.eu/information_society/newsroom/cf/dae/document.cfm?doc_id=1252. [Accessed 26 November 2013]. European Commission (2012c), Draft regulation of the European parliament and of the council on the protection of individuals with regard to the processing of personal data and on the free movement of such data (general data protection regulation), http://ec.europa.eu/justice/data-protection/document/review2012/com_2012_11_en.pdf. [Accessed 26 November 2013]. European Commission (2013), eHealth European interoperability framework study, http://ec.europa.eu/digital-agenda/en/news/ehealth-interoperability-framework-study. [Accessed 26 November 2013]. European Parliament (2013), Resolution of 4 July 2013 on the US National Security Agency surveillance programme, surveillance bodies in various Member States and their impact on EU citizens’ privacy. http://www.europarl.europa.eu/sides/getDoc.do? type=TA&language=EN&reference=P7-TA-2013-322. [Accessed 26 November 2013]. European Union (1995), Directive 1995/46/EC of the European Parliament and of the council of 24 October 1995 on the protection of individuals with regard to the processing of personal data and on the free movement of such data, OJ L281 23/11/1995 (31-50). http://ec.europa.eu/justice/policies/privacy/docs/95-46-ce/dirl995-46_partl_ en.pdf. [Accessed 26 November 2013]. European Union (2005), Directive 2005/36/EC of the European Parliament and of the council of 7 September 2005 on the recognition of professional qualifications, OJ L255 30/09/2005 (22-142). http://eur-lex.europa.eu/LexUriServ/LexUriServ.do?uri=OJ:L:2005:255:0022:0142:en:PDF. [Accessed 26 November 2013]. European Union (2011), Directive 2011/24/EU of the European Parliament and of the council of 9 March 2011 on the application of patients’ rights in cross-border healthcare, OJ L088 04/04/2011 (45-65). http://eur-lex.europa.eu/LexUriServ/LexUriServ.do ?uri=OJ:L:2011:088:0045:0065:en:PDF. [Accessed 26 November 2013]. Greenwald, G. and MacAskill, E. (2013, June 6), “NSA Prism program taps in to user data of Apple, Google and others”, The Guardian, http://www.theguardian.com/world/2013/ jun/06/us-tech-giants-nsa-data. [Accessed 26 November 2013].